The Table of Silence – Constantin Brancusi. 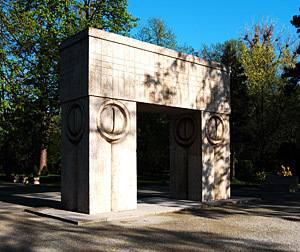 The Table of Silence, The Kiss Gate and the Endless Column – these are the three sculptural components from Targu-Jiu, made by Constantin Brancusi, which constitutes an homage to the hero soldiers fallen during the First World War. The initiative of achieving this ensemble belonged to Aretia Tatarascu, in 1937. The three sculptural elements are disposed on an axis 1,275 meters long, oriented from West to East, in the Central Park. 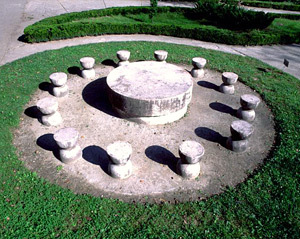 The Table of Silence (Masa Tacerii) is made in limestone and it has the following dimensions: panel diameter 2, 15 meters, thick 0,43 m and the leg is 2 m in diameter and 0,45 m thick. According to the exegetes of the Brancusian art, the Table of Silence represents the table around which gather the soldiers before confronting their enemy. At the same time, the chairs stand for the time disposed in hourglasses. Some make an analogy with The Last Supper of Leonardo da Vinci. Next comes the Chairs Alley representing those who participate without any implication, waiting for the end. The Kiss Gate – Constantin Brancusi. The Kiss Gate (Poarta Sarutului) is the second element of the ensemble. Technically speaking, it is 5,13 m high, 5,45 m long and the pillars have 1,69 m width. This time, the material used was Banpotoc travertine and in order to achieve the Gate, Brancusi was helped by two stone carvers: Ion Alexandrescu from Bucharest and Golea from Dobrita. It’s significance is very simple: the Kiss Gate makes the transition to another life, and the motif on the pillars stands for the eyes looking inside. The Endless Column – Constantin Brancusi. The Endless Column (Coloana fara Sfarsit) or the Column of Gratitude29,33 m high, is the third element of the ensemble, being situated at the eastern extremity of the axis forming the Alley of Heroes. The column is made out of 17 rhomboidal cast iron modules, measuring 1,80 m high each and about 860 kg, moulded in the Central Workshop from Petrosani. The modules are fixed on a steel axis. The one who ethnically coordinated the assembling of the column was the engineer Stefan Georgescu-Gorjan. 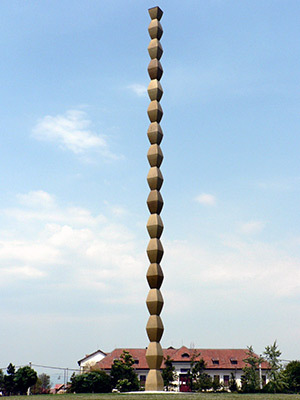 Otherwise, the Endless Column is considered to be the “spiritual will” of Constantin Brancusi. Some exegetes of the Brancusian art consider it necessary to complete the image of the Ensemble, between the Kiss Gate and the Column, with the waters of the river Jiu, running nearby, and then with The Heroes’ Way representing the way of the souls of “heroes soldiers” and also with the Church “Sfintii Apostoli”, the place where takes place the purification and the passage to the non-being. 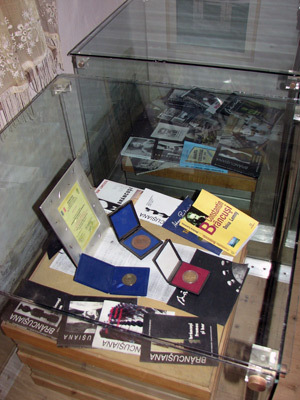 The whole ensemble from Targu-Jiu was inaugurated on October 27th, 1938. Unfortunately, for almost 25 years, all three elements were abandoned because of the fact that the political power of that age considered Brancusi as a representative of the bourgeoisie. Only 7 years after his death, in 1964, did initiate the process of rearrangement and consolidation of the Ensemble. After 1989, the monumental Ensemble from Targu Jiu was enlisted in the European heritage, alongside with the Romanian Athenaeum, the Fortress of Histria and the Cantacuzino Palace. The Memorial House Constantin Brancusi. Constantin Brancusi was born on the 19th of February 1879, in the village of Hobita. His first school years were at Pestisani and Bradiceni. 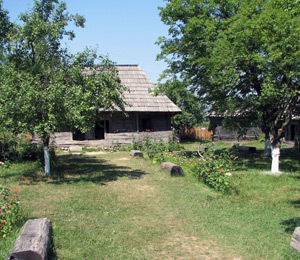 A restless spirit, by the age of 11 he runs away from home and goes to Targu-Jiu. After being brought back in the family, he found another good opportunity and ran to Slatina, and then to Craiova where he searched for a job and got hired in different places. In 1894, at 15, he applied for the School of Arts and Crafts which he was going to finish in 4 years instead of 5. After graduation, he left for Bucarest where he applied for the School of Belle Arte, where he was guided by Vladimir Hegel. During this period, he realized the works Vitellius, the Portrait of Georgescu-Giorjan and the “Ecorseu”, for which he was granted a number of medals at different contests. After graduating the School of Belle Arte, at 24, in 1903, he left for Munchen, and then, on foot, for Paris. In the capital of France, he worked for two years until he succeded in being accepted at Ecole Nationale des Beaux-Arts, in Antonin Marcier’s workshop. During this period he met Rodin. Since 1910, he starts working at the cycle of the Birds and also at the cycle Miss Pogany, and in 1914, he had his first personal exhibition in New York. From 1919 until 1939, represents the most procreative period in all his activity. For 20 years, he had plenty of personal exhibitions and took part in 57 group exhibitions in different countries. The execution of the monumental sculptural ensemble from Targu Jiu started in 1937, at the initiative of Aretia Tatarescu, president of National League of the Women of Gorj. After attending the age of 60, tired, Brancusi worked less but his influence left important marks on the contemporary sculpture. He died on the 16th of March 1957, by the age of 78, at Paris. 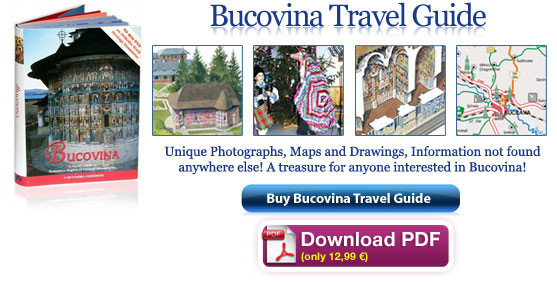 I am romanian, born in Romania, living in Romania. I am fully agree with your point of view ( or more than that, your feelings ) about Brancusi. Hope to hear about you. Like any truly great work of art, “The Hero’s Journey” ensemble in Targu-Jiu defies literal interpretation. Talking about its meaning is like pointing out pictures in the clouds. Brancusi’s intent and meaning can only be experienced, not described, and may be different for different individuals on different days or at different times in their lives. That having been said, my personal opinion is that Brancusi’s work is more of a spiritual metaphor for life than a monument to the fallen soldiers of World War I, though that is also a perfectly valid interpretation. Environmental sculpture is another aspect of modern art where Brancusi pioneered, and “The Hero’s Journey” can be experienced either by going from the Endless Column through the Gate of the Kiss to the Table of Silence, or the other way around–going from the Table of silence through the Gate of The Kiss to the Endless Column. The Table of Silence is located in a quiet park above the town. It is the centerpiece of a shady environment that is conducive to meditation and contemplation. When I was there it was actually possible for me to sit on the stone stools and experience their coolness and solidity. The environment is–and how original of me!–womb-like. One walks from the Table of Silence down a pathway to the Gate of the Kiss a short distance away. The symbolic meaning of the Gate of the Kiss is well-known and given away by the name, but what one experiences after leaving the Gate of the Kiss is to descend into the bustling and noisy life of the living town below. Again–how original of me–it is like being born. One goes through the town like just as one goes through one’s own life. I don’t think it is any accident that the community’s major church is in a direct line between the Gate of the Kiss and The Endless Column. If you visit, you will be presented, as I was, with the choice of either going through the church or around it. And, as I said, it is equally valid to take the journey in the opposite direction. I leave that to the reader’s imagination and highly recommend the experience to anyone who enjoys experiencing art. is and what is its worth?